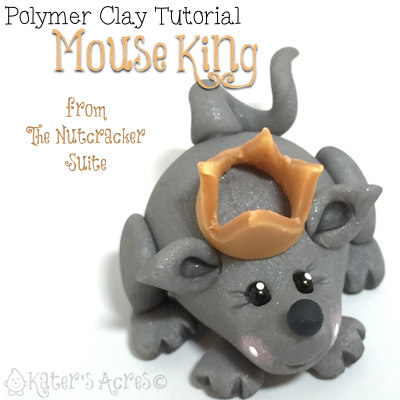 The Nutcracker Suite presents: the Mouse King tutorial! Members of the Whimsical Sculpting Tutorial Club have been on quite the adventure this month. They received two doll tutorials teaching them how to make dolls from The Nutcracker Suite. This month they received both Clara and the Nutcracker himself. This tutorial is so that everyone can make a simple Mouse King to go along with their dolls. One of the reasons that I chose The Nutcracker Suite as our theme for Club Members for November is because of my own personal love for the Nutcracker Ballet. Every year as a child my Mom would take me to the ballet to see the Nutcracker. I loved the music, the story, and all the characters. My favorite character (like so many others) was of course the Nutcracker. I love how he turns into a Prince in the end, it was always like a fairy tale story. Clara and the Mouse King were two of my other favorites. What would the ballet be without either of them.